At this week's New York Auto Show, Nissan unveiled a new version of its Versa small car, letting them finally drop the stripped-down version of its Versa sedan, the lowest-priced new car on the market, with an advertised sticker price of $9,990. With its demise comes the death of the sub-$10,000 new car. Here's why that's a good thing. Back in 2008, when the economy was at its Carpocalyptic lowest, Nissan and other automakers battled to see who could slap the lowest price on their tiniest econoboxes. Nissan won, lowering the price of their Versa to $9,990. 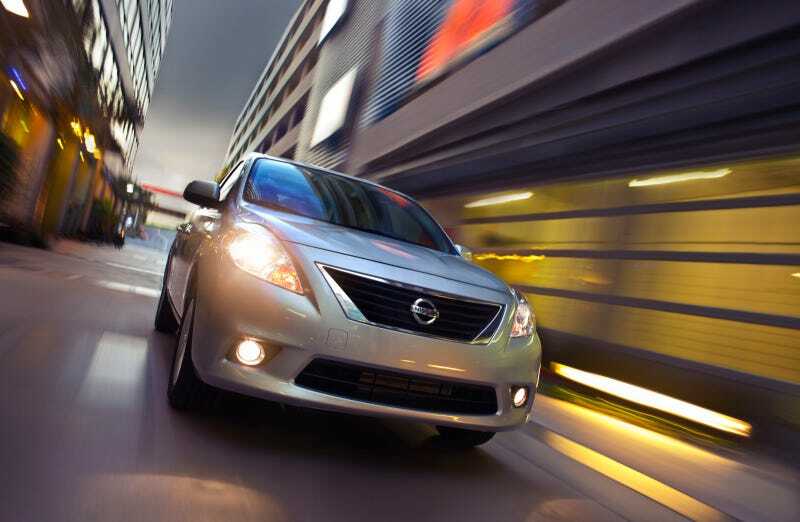 As far as minimal transportation goes, the Nissan Versa's always been a fairly good bet. It's roomy, mildly attractive, has decent utility, and it's secretly a much better drive than the Nissan Sentra. But the $9,990 version was nothing more than a gimmick. It didn't come with A/C, it had the not-particularly-efficient and smaller 1.6-liter fourbanger, and a cheap cloth interior. While a striped-down package on, say, a Ford Mustang, might interest enthusiasts, the idea of a stripped-down econobox was so out-of-touch with what mainstream car buyers were looking for, dealers were rarely willing to stock the car. You were more likely to find a golden ticket in a Wonka bar than to find someone selling a $9,990-out-the-door Versa. Top that off with a destination charge that raised the actual price to $10,740 and it's clear this was mostly a marketing exercise — a trick to get people to go to Nissan dealerships. But when they got there, they likely quickly left. Fast forward to last week's announcement of the $10,990 Nissan Versa. The sedan now comes with air-conditioning, more humane interior coverings, 15-inch wheels, and a bump in fuel economy to 37 mpg highway over the 34 mpg of the outgoing version. Thus ends the winter of our decontent. Nissan still wants to playing pricing games, but the big news here isn't that sub-$11,000 is the new sub-$10,000. It's that in a world with a plethora of used cars and Korean automakers flooding the entry-level market with good cars that are well-equipped, the formula's changed: Value is the new cheap. And that's good for everyone.